The punctuated equilibrium” model aims to explain why public policies tend to be characterized by long periods of stability punctuated by short periods of radical change. This model can help public health actors understand why governments are sometimes receptive to evidence and discussion leading to significant policy change, whereas at other times, government are less receptive to change and only open to making minor adjustments. This model can also help guide the actions and strategies that public health actors can use to influence public policy. 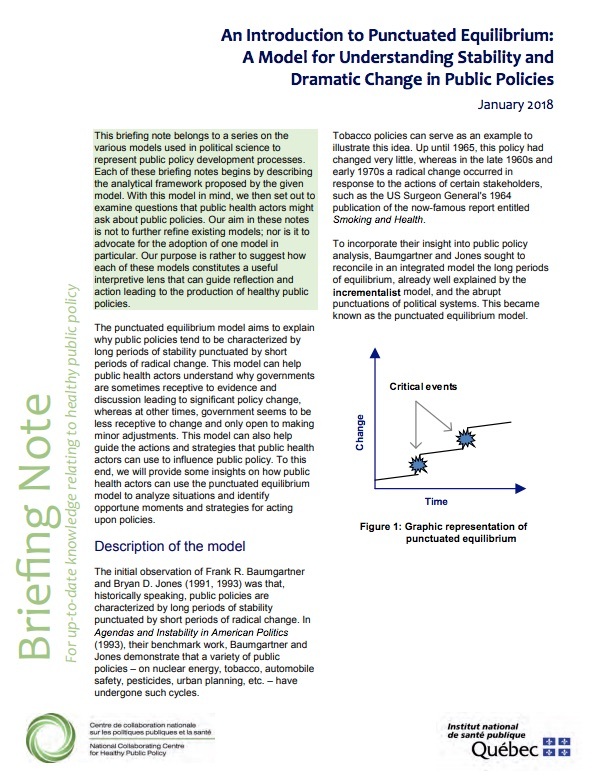 The briefing note linked below provides insights on how public health actors can use the punctuated equilibrium model to analyze situations and identify opportunities and strategies to act upon policies. To learn more about this work, visit the NCCHPP website.